On March 14 and 15, Modern Cancer Hospital Guangzhou held a large volunteer medical consultation activity named “Borderless Medical Service, Global Village” in Friendship Square, Deng Feng street, Yue Xiu district. 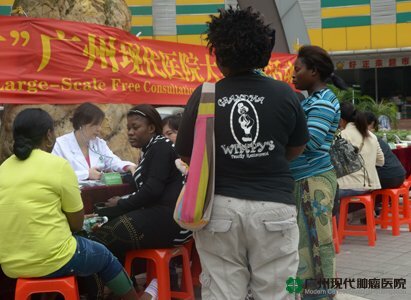 This activity aimed to popularize health knowledge and provide free examination & consultation to nearby local citizens and foreign personnel working in Guangzhou. Besides that, each visitor got a gift during the consultation. “Doctor, I got hypertension. What should I do? By the way, my blood pressure measuring instrument was broken. Can it be fixed? Otherwise, where can I buy a new one?” a Guinean man asked chief physician Dr. Cao Chun with a wrist electronic blood pressure meter in his hand. He said he has had hypertension for more than ten years. He often had dizziness and was easy to get irritated. “Don’t worry. We will help you buy a new blood pressure meter. As for your hypertension, you need to go to the hospital for a comprehensive examination to check cholesterol, lipids, kidney function at first. Doctors will make a treatment plan for you according to your condition and medicine history”, Dr Cao patiently answered his inquiries. The patient then made an appointment before leaving with satisfaction. Deng Feng street is a gathering place for Africans. Because there are not many hospitals providing services to international friends and language obstacle has always been there, to see a doctor has become a common problem of the foreign personnel there. Modern Cancer Hospital Guangzhou sent experts from various departments, including dentistry department, ENT department, gynecology department, international department, and integrated TCM and Western medicine department, to provide on-site consultation to the international friends and help them get to know their physical condition. By giving them professional examination and suggestion, the hospital hoped to give them help in early prevention and treatment, so as to help the sick get treatment timely. The activity started at 9:00 a.m. and ended at 6:00 p.m. Many adult foreign personnel came for consultation and had tests, including BMI test, blood sugar test, blood pressure test, etc. Some mothers also took their children there for consultation. Dr. Cao Chun together with other doctors and interpreters communicated with the patients in fluent foreign languages and gave them professional medical advices.